Sometimes a wine is remembered more for a sense of place and time rather than the flavours it brings to the table. This is very much one of those wines. We were in Dublin when the city was awash with Americans who had just seen a College football game between Georgia Tech and Boston College and people from Tipperary and Kilkenny who were in town for the next day’s All Ireland Hurling final. This was not conducive to getting a table at any restaurant (or getting a quiet night’s sleep). Then the heavens opened, the rain came down so hard it hurt and people crowded into bars and restaurants that had no room for them. We crammed into an Italian restaurant and were seated at a table already occupied by a Canadian couple who had decided to stop off in “the old country” on their way to a business engagement in Austria. They hadn’t planned to share their romantic evening, but nor had we. We ordered some wine to share with our new table friends. It’s awkward not to engage in conversation when you have to take it in turns to eat forkfuls of pasta to allow room for your neighbours’ elbow maneuvers so we quickly got to know each other and it turns out that whilst we didn’t know a single person in common, we had plenty of shared interests and lots to talk about. Meanwhile we drank the wine. 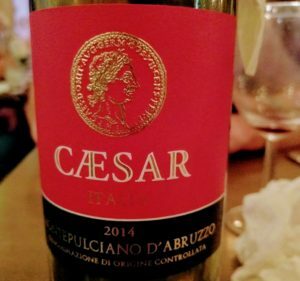 This Caesar Montepulciano D’Abruzzo ’14 wasn’t a great example of Montepulciano D’Abruzzo, but it was very like wines I’ve tried at Italian restaurants in rural Italy as I’ve cycled through. It looked a little thin and had a little volatile acidity, smelling vaguely of balsamic vinegar, but in the warm sweet way rather than an unpleasant gone off way. The acid was rather more than the fruit could carry, with a little pepperiness that did go well with my mushroom and Gorgonzola dish. I wouldn’t choose Caesar again, and I doubt I’d choose the same restaurant again, based on food alone, but the evening was an enjoyable one, shared with strangers who became friends for a couple of hours in a city where everyone is at home.